An original image has width 8 inches and length 12 inches. These dimensions can be represented by the point (8, 12) on a graph. How can you use the graph to figure out if a change in dimensions is proportional? Ratios and proportion can be applied to many routine problems encountered in everyday life. A direct proportion between two variables means that one variable is a constant multiple of the other variable. The terms “proportional relationship”, “direct variation” and “direct proportion” all mean the same thing. The terms are interchangeable. k is a constant. It is called the “constant of variation”. In other words, a direct proportion means that DIVIDING the value of ONE VARIABLE BY THE value of the OTHER variable is a CONSTANT value (k, the constant of variation). (I’ll apply this idea to your problem shortly). For example, if you have a job and are paid by the hour, your pay is proportional to the number of hours you work. The more hours you work, the higher your pay. The fewer hours you work, the lower the pay. However, your total pay divided by the total number of hours you work is a constant value. If your rate of pay is $25 per hour and you work 10 hours, you will earn $250. If your rate of pay is $25 per hour and you work 1000 hours, you will earn $25,000. Pay divided by hours always EQUALS the same number, the CONSTANT of variation. In this example the constant of variation is 25. The constant of variation (25) will not change, regardless of the number of hours you work. You need to calculate k, the constant of variation, before the proportion can be graphed. How can you use the graph to figure out if a change in dimensions is proportional? If a plot of the image dimensions (width and length) fall on the graph of the equation y = 1.5x, they are in the correct proportion. 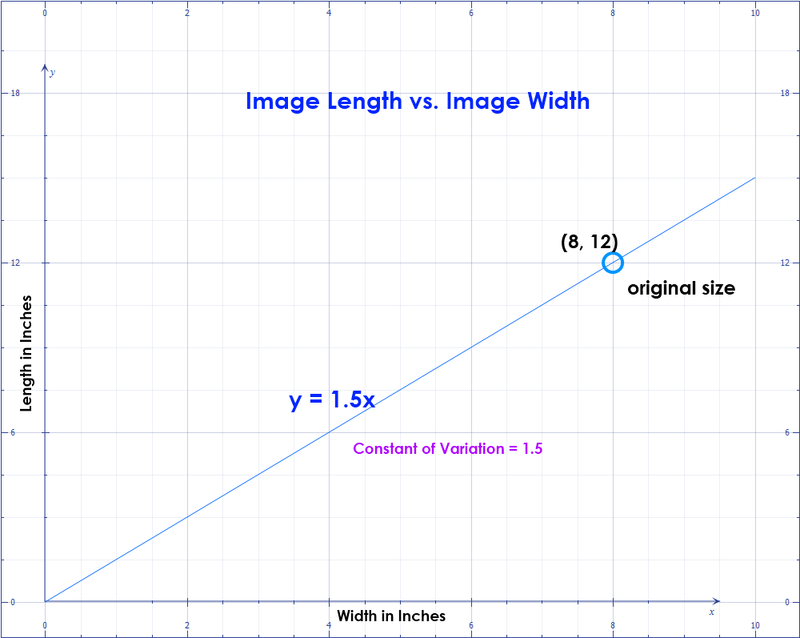 If the image dimensions do not fall on graph of y = 1.5x, the proportion is incorrect.